"In the little exhibition of the Society of Polish artists there are an unusually large number of interesting paintings, either from the painter's technical point of view, or the layman's story-telling point of view, of both. 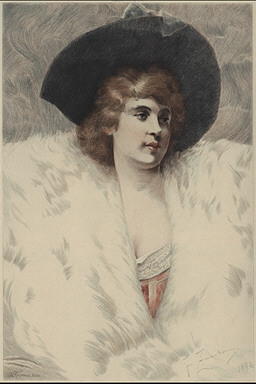 Some four or five of the most important of these were furnished by a Warsaw artist, F. Zmurko, and among the most striking of his artistic canvases is the very effective presentation of the head of a handsome young woman in a big hat and a wilderness of gray fur. The summary, decorative manner in which this fur is painted, and the fine style of the youthful wearer, render this one of the handsomest canvases in this gallery, and have enabled the skillful etcher to translate most of its merits into this handsome plate before us."